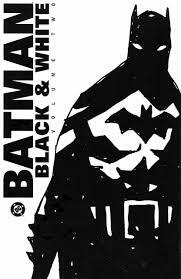 I've always enjoyed the, "Batman: Back and White," comics when they occur. Besides the fact that Batman's adventures just feel right in the stark lack-of-color-scheme, the out-of-continuity tales generally impress. The stories can vary in tone from dark and dreary to fun and peppy, and they seem to attract some of the best creators, with the table of contents for this book being a veritable who's-who of immense talent. You've got folk such as Alex Ross, Gene Ha, Dave Gibbons, Kyle Baker and Jim Lee to name artwork alone, Warren Ellis and John Arcudi contribute writing, and even more great comic-makers such as, Howard Chaykin, John Byrne, Gene Colan, Chris Claremont, etc. etc. are in these pages. Seriously, this book is jam-packed with amazing creators all who were making some great stuff years ago (and many still are making stellar works) when these comics came out and then became collected in this trade paperback of goodness. Not every story is a winner, of course. Some are a bit heavy-handed in plot and sometimes the artwork leaves a bit to be desired, but so much is so good that you can't really complain. I mean, we get lovely Paul Pope artwork on one page and hilarious Paul Dini-yarns on another! Writing royalty such as Harlan Ellison provide a story and Tim Sale's always-great work appears too. There just is so much incredible wisdom, skill, and generally amazing stuff this book is a pleasure to read whether you're someone who recognizes all these creators or a complete newbie to comics who just enjoys great Batman works. These definitely are the kinds of comics you want to flashback to.